Every time we drive through Glen Coe, we pass the Church of St John in Ballachulish. It’s not the church itself that draws my eye but a small rectangular building just to the side of it. Built of stone, it has a slate roof adorned by a simple wooden cross; a window or second entrance looks to have been filled in quite some time ago. In late May and early June, it is surrounded by a sea of bluebells. So what’s the story behind this lovely little place? Who was Bishop Forbes? And why did he have to preach from a store room? In 1688, James II of England and VII of Scotland abandoned his throne in the midst of rising opposition to his strong Catholic faith and his belief in the Divine Right of Kings. In his place came William of Orange, who was married to James’ Protestant daughter, Mary. Their overthrow of King James was hailed as the ‘Glorious Revolution’. In Scotland, a large number of the Highland clan chiefs were either Catholics or members of the Scottish Episcopal Church; they remained true to James VII, and in 1745 many were drawn to their doom by the charismatic appeal of James’ son, Bonnie Prince Charlie. Among the Prince’s secret supporters was a clergyman by the name of Robert Forbes; he was arrested and imprisoned, but later released. Forbes was ordained as Bishop of Ross and Caithness in 1762. Ballachulish lies at the foot of Glen Coe, on the shore of Loch Linnhe. The church and former chapel can be found on the left, just to the west of the village. If you want to see the bluebells in flower, visit between the middle of May and the beginning of June! More features to interest you…. Those bluebells are so beautiful!! Is there any information as to why he preached from just the doorway? As I read I was thinking perhaps they held services within the store room. I imagine that, on this occasion, the congregation was so big that they wouldn’t all fit in the chapel – everyone would have come to hear such an important minister, so there could well have been hundreds! Yes, the bluebells were beautiful, they are just coming into flower now and the scent is lovely. That would make complete sense. I should’ve thought of that. It’s a beautiful little building and very nicely presented in your photos. Is it possible to get inside? Thank you, Lorna. No, the door looked as if it had a padlock on it. We didn’t have time to check, but next time I will, because I want to go inside the church as well! Very interesting post. That last picture is absolutely spectacular. Thank you very much, Colin! Glencoe was stunning that morning, and the bluebells were fantastic. It’s tempting to just jump in the car and go back there! Oh I love Glencoe – such dramatic scenery and history to match – I can’t drive through the mountains without thinking of the massacre and the people fleeing into those hills – one day I will stop and walk instead! I know, Anny, it strikes me the same way – those mountains hold a lot of memories. 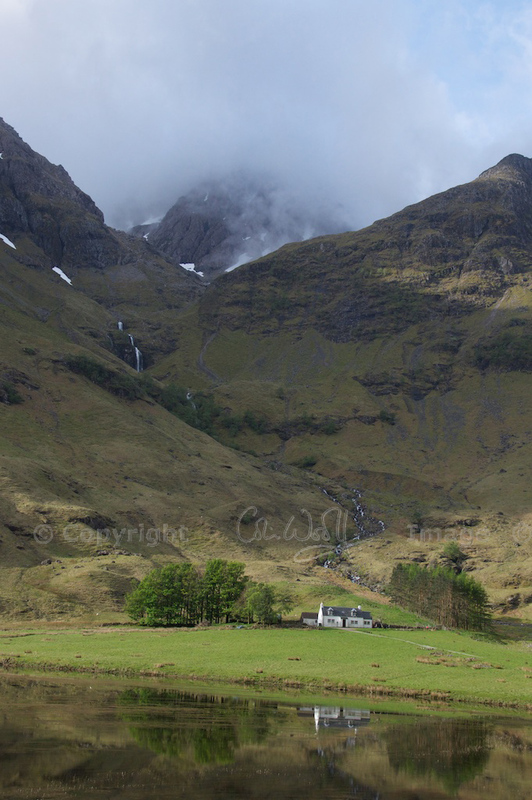 I know, the mountains around Glencoe are just spectacular, in all weather. But we were so lucky that morning! My partner and I where married in St Johns this year by the priest of the Scottish Episcopal Church. We had an amazing day in such a beautiful place, 6 years previous when we where driving by after staying in Fort William for the weekend we stopped at the church and just where in awe of the Chapel and the scenery and that stayed in my heart, then 6 years later that’s where we decided to elope and get married.